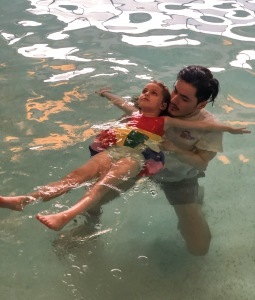 It has been 2 months since I enrolled Teddy in swim classes at British Swim School and I am thrilled to see such great progress already. My daughter Mae started about a month and a half ago and is also doing very well! 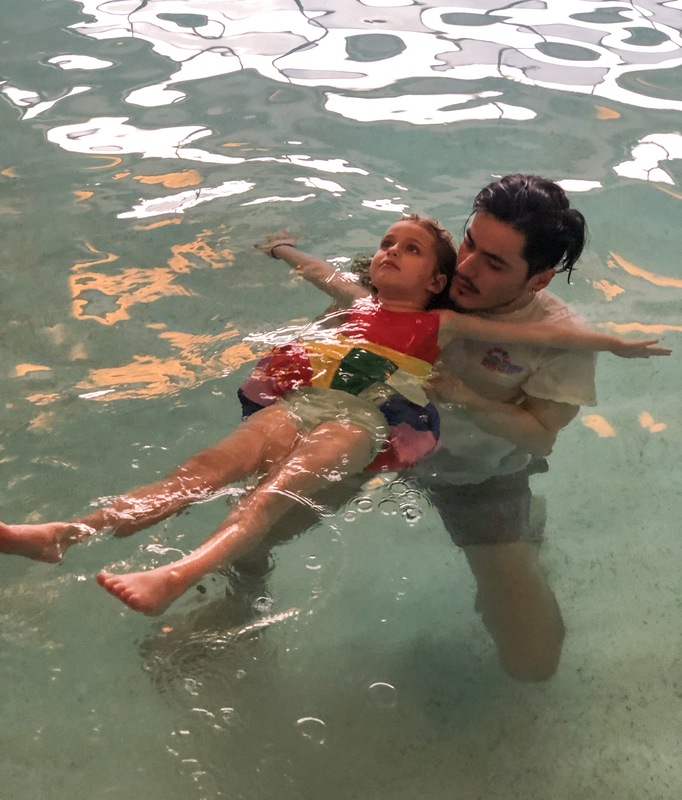 It is so rewarding for both the kids and I to see their efforts paying off and I am excited to see their next steps here at British Swim School! A water acclimation class for infants and toddlers to introduce them to the water for the first time, reducing their fear and the potential of tears. We’ll introduce an assisted back float and submersion in this level. You should expect a lot of songs and splashing in this class while your infant freely and independently explores the water environment. Teddy cried during parts of his first few classes and the instructors assured me it was completely normal and that eventually he would get used to it. And he did! Our lesson this Sunday was his best yet. He would typically cling to me and whine during his assisted back float but he has stopped! He knows what to expect now and was super relaxed doing his back float! He also completed 3 submersions without tears and was even okay with me letting go of him while he was in the swim ring. Pretty amazing since he always clung to me like a baby koala before. It is easy to get discouraged when your child is scared or crying but it is so important to not give up! I see how the British Swim School program works and how the results will come! Geared towards gentle water exploration and developing the child’s awareness to the aquatic environment while introducing the water survival exercises used in later classes. 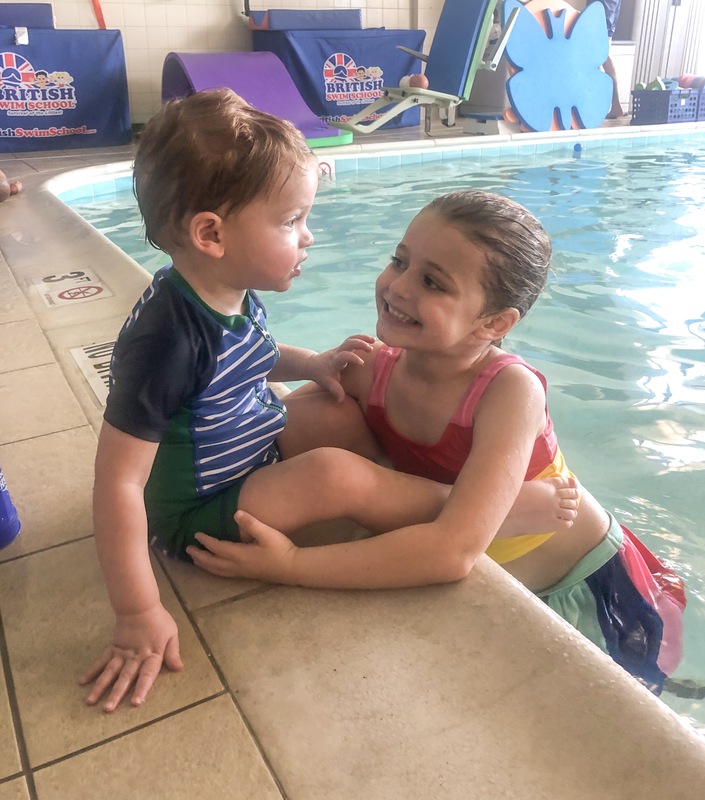 The total aim is to build confidence and self-esteem as well as develop awareness, and the ability to respond to new challenges while giving your child independence to explore the aquatic environment. Mae is my kid who loves the pool but has always had a big fear of going under the water. I have tried several different swim schools in the area over the past few years and we never found a great fit for her. There were many lessons that she painfully cried through. I had a private instructor come to our backyard pool last summer to give her lessons thinking she would be more comfortable at home. She did do much better but was still very stubborn and wouldn’t go underwater for the private instructor either. Feedback from other swim coaches was to try group lessons again because it helps to see other children doing the skills along side them. 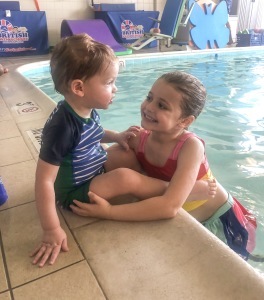 After I started classes with Teddy at British Swim School, I felt that the program and instructors would also work for Mae. She is doing great and looks forward to her lesson each week, asking me “how many days until my swim class?”. This is a huge improvement since she would always dread swim lessons at other places and cry even before we arrived at the pool. Mae has completed all the goals of Starfish except for the full submersion. She is comfortable putting her face in the water for a brief second but is still very stubborn about going under. I know she can do it but she just doesn’t want to! I have no doubt she will gain her confidence as we continue lessons and when she is good and ready she will go for it! Until then we will just keep practicing and keep her enjoying the water until she will take that next step! 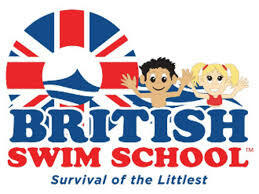 British Swim School is the best option (in my opinion!) for young children beginning to learn water safety skills. We have really had a fantastic experience and I’m happy to extend an enrollment special for $20.19 off your first month of group lessons with code #CapMom19. There are 10 different pools in the area where classes are held, so it’s easy to find a convenient location. Information for the Central Maryland British Swim Schools can be found here.